So you know how when I get obsessed with something, I actually get OBSESSED???? 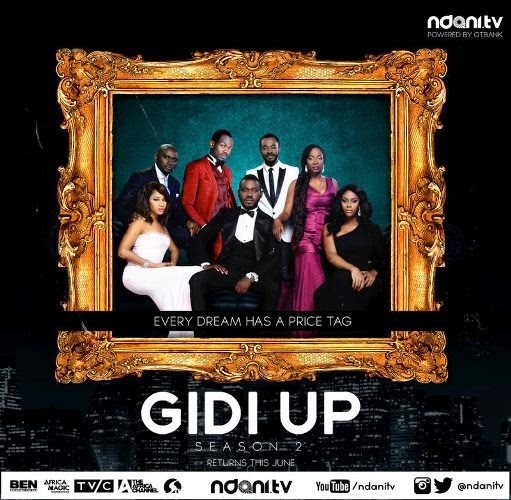 Well, my new obsession is a web series called Gidi Up on the Ndani TV channel on YouTube. This series has me seriously buzzing! I'm obsessed with the storyline, the setting and most especially the cast. That cast though!!! What!!!!! OC Ukeje, Deyemi Okanlawon, Somkele Iyamah, etc. Fabulous ensemble cast.The casting director is Kemi "Lala" Akindoju, a renowned young actress herself, who did a phenomenal job casting the series and it was directed by Jadesola Osiberu. Disclaimer: This is not a paid advert btw. I don't have that sort of reach and they would be completely foolish to give me moolah to plug them as I know EVERYONE that reads my blog. I swear I do. Lol! I just appreciate good programming when I see it and I want everyone to share in my experience. So let the review begin. I'm not going into the story proper but the series is about the lives, loves and struggles of 4 friends in Lagos. What I found completely awesome about this story is that it had the tendency to go the way of so many Nigerian series scripted around the lives of the new, young, monied, JCB (Just Came Back) Nigerians. Those series did not gain any sort of traction and failed miserably because they were just not believable. Gidi Up, through some divine touch, is completely relate-able though it leans more towards affluent Lagos. I watched it and felt like these guys were my friends giving me gist. The cool thing about Gidi Up is for every single character reflected, you know at least one person in your circle who is ably represented. There's Tokunbo; the misunderstood kid who wants to "do his own thing" and whose parents, especially his dad, feels should get a proper job and stop horsing around. There's Yvonne; the fashion designer who is struggling to stay afloat in a circle of RMK (rich man's kid) friends and who has made a series of bad choices in order to establish herself and her brand; including going down the famed aristo track. There's Obi; also not a RMK by birth but his hustle is the realest! He's one of those guys in Lagos that live the GL lifestyle: all seems to be glittering but none of it is actually gold. Ladies man par excellence who would go to great lengths to fund his unrealistic lifestyle and his antics landed him in a whole heap of trouble. Finally, there is Eki; serious JCB with a career in photography. She's the lover girl of the series and has fallen hard for Tokunbo but is on the verge of regretting that action. These guys are all people we know and it is great that their stories are told in such a believable and entertaining manner. The Gidi Up supporting cast also have very rich storylines and backgrounds which just ties the whole series nicely together and you can sort of follow better. I like how the series captures the face of new Lagos; paying homage to the 'new' career paths, articulating the angst and generally lending itself to defining who the new Lagosian is. Asides from an excellent cast, the visuals are stunning! Matter of fact, the production quality is the best I have seen so far out of Africa. There are stunning aerial shots of Lagos that would make you swear you were in Greece or something! Lagos was presented as such a beautiful and vibrant city. They managed to harness that certain je ne sais quoi that Lagos possesses which makes it such a wonderful city to live in despite its wahala. The Director's ability to capture the essence of contemporary Lagos was completely spot on. It showed a Lagos I was familiar with. When I see some depictions of goings-on in cosmopolitan Nigerian cities in a some of movies, I find them laughable. But this was a scene I knew and had visited so I understood it. If you love Nigerian/African music, there's something for you on Gidi Up. The scores were awesome songs; some I had heard, some I didn't know existed. They were kind enough to have dialogue boxes with artistes' names and song titles. It is a good way to promote Nigerian/African music and it was nice to see that collaboration between the two industries. My one criticism would be the 'forne'. Should I call it a continuity issue? Obi and Yvonne supposedly grew up in the East and migrated to Lagos in search of greener pastures as adults. I'm not saying they should speak like Aba traders selling "jean" but I expected a regular, educated Nigerian accent, not this carefully cultivated accent that we all affect as JCBs, where you are not even sure where the person went to school any more as Americana is spilling into Queens English. I'm just so tired of the gradual eradication of the regular Naija English that served our parents, and coincidentally ourselves (for a few years) well before we decided it must be sacrificed at the altar of forne. This is why Funmi Iyanda is my favourite Nigerian journalist till date. She remains unbowed and proud to speak like she's always done. More power to her. But...I digress. All in all, top marks for content, interpretation of roles, production quality, set and costumes. This is intelligent entertainment and it is a trail blazer for other web series. Gidi Up is how TV should be done and I am proud that such top quality has come out of Nigeria. Is it telling that such quality TV is actually not on TV? Is that indicative of something? Anyway, the series is now in its second season. In season two, some of the key characters were replaced by different actors but their story lines remain the same. The series also has a number of interesting cameos: Joke Silva, Ireti Doyle, Bimbo Manuel, Ikechukwu, to name a few, which again, speaks to the quality of the show. So you can catch up on Season 1 here. The entire season is upwards of 50 minutes. The second season, however, is in 30 minute-episodes. Rolled in the same circle as most of these people in UNILAG. Mostly fellowship people. I am proud of them. Awww You all rocked the foundation of UNILAG together right? lol! Cherrywine!!!! I just discovered Gidi up today on youtube and watched Season 1 and Season 2, E1-5, it kept my glued to the screen. Awaiting the next Episode or season, whichever they want to release. Definitely my fav Naija tv show, maybe after Super story (not sure they still run that). Been waiting for season 3 for almost a year now, such a letdown.